Maximum TV Holding Capacity: 110 lbs. The Pyle Wave Base Bluetooth Tabletop TV Stand Speaker System is what your entertainment system has been missing. It's easy-to-setup and easy-to-use! Built-in Bluetooth allows you to wirelessly stream audio from your favorite Bluetooth devices (works with virtually all Bluetooth-enabled devices like iPhone, Android, Smartphone, iPad, Tablet, PC, etc.). 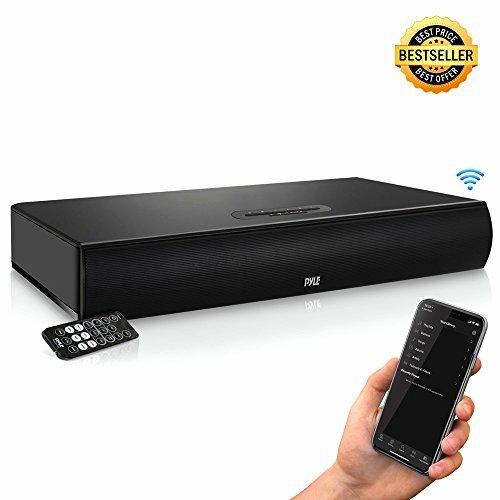 The sound bar features exceptional sound reproduction technologies that effectively recreate the entire audio spectrum with this all-in-one compact system. Speaker features include bottom-mounted subwoofer with ported tube design that allows for extended bass performance and 4 full-range speakers that bring you crisp, full-bodied sound. The system brings your home theater to life and allows you to place your TV right on top while enjoying high-definition sound. Connect the system to additional external devices like your TV, laptop, computer or home theater thanks to the AUX (3.5mm), Digital Optical and RCA Stereo input connector jacks. Add rich sounds to any audio source that brings your music and movies to life! System includes full function remote control, so you can control your Bluetooth device, change inputs and adjust volume from anywhere in the room. Let Pyle improve your home audio experience by adding clean and simple style -- with next-generation sound technology. Upgrade your home entertainment system with the Pyle Wave Base Digital Speaker System. (Model: PSBV600BT).